Sensei Meenu and her students displayed a variety of styles and variations in our annual exhibition. From no-kenzan compositions to minimal interpretations to sing of local material, enjoy the compositions below. 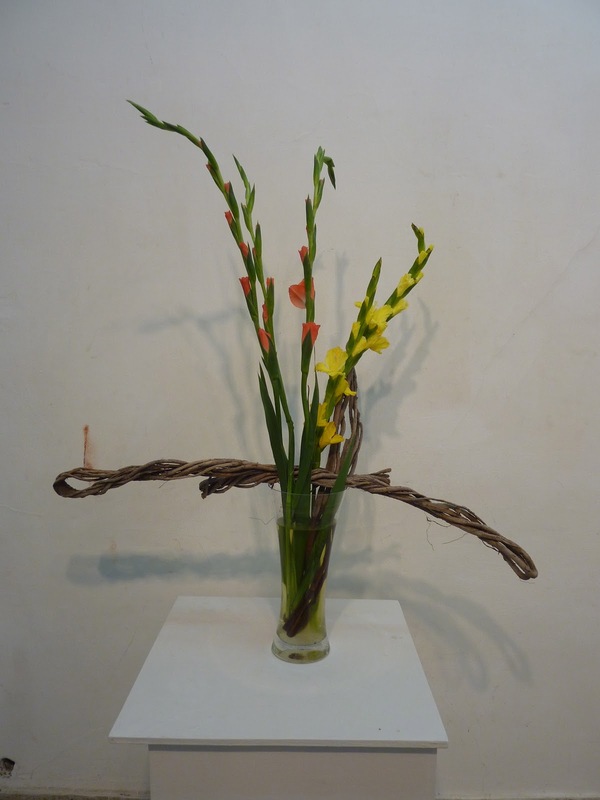 I have used tamarind branches and guava branches without kenzan, canna buds, amaralyis and water hyacinth. I think l will call it The nest. 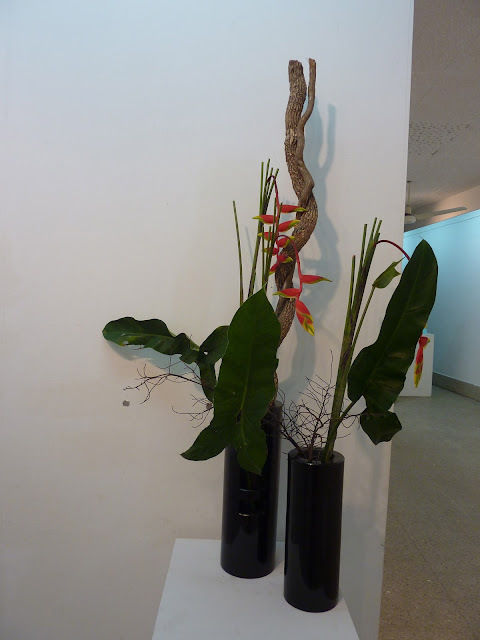 By Meenu - "Twin Towers" The woven branches of palm added an unusual touch, and the interesting openings in the vase were used to add colour with button chrysanthemums. 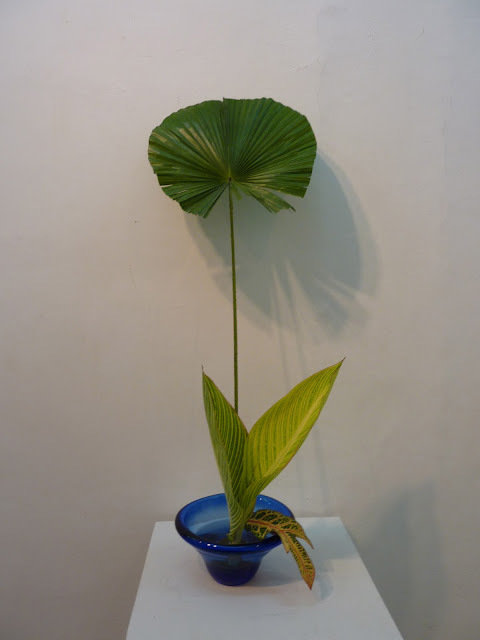 By Meenu - Minimalism. Brds of Paradise flowers with hosta lily leaves in a ceramic vase. By Meenu - I call this Kalpataru. Two cleaned and polished coconut shell form the base, inside which I have placed a small container that holds the flowers and greens. 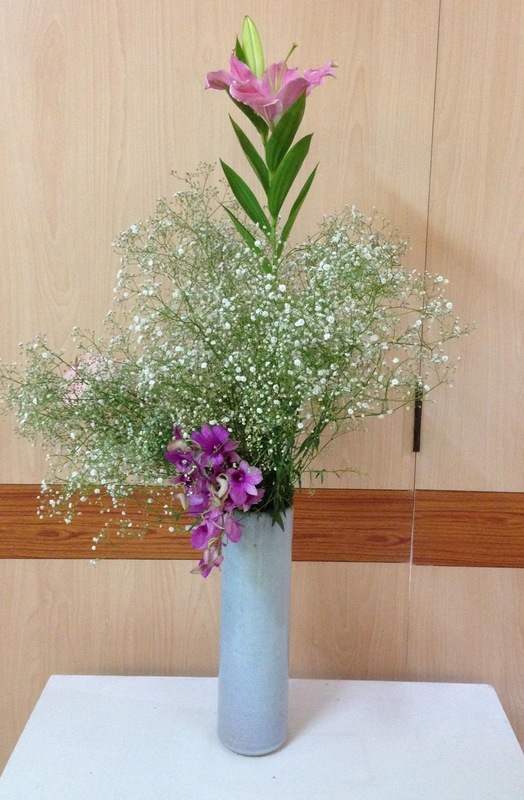 Chitra created her arrangements with her usual flair and joy. And also helped Malathi sensei to recreate Seetha's compositions, as a result of which Seetha was also present in spirit, despite being pulled away from the city unavoidably during the exhibition. 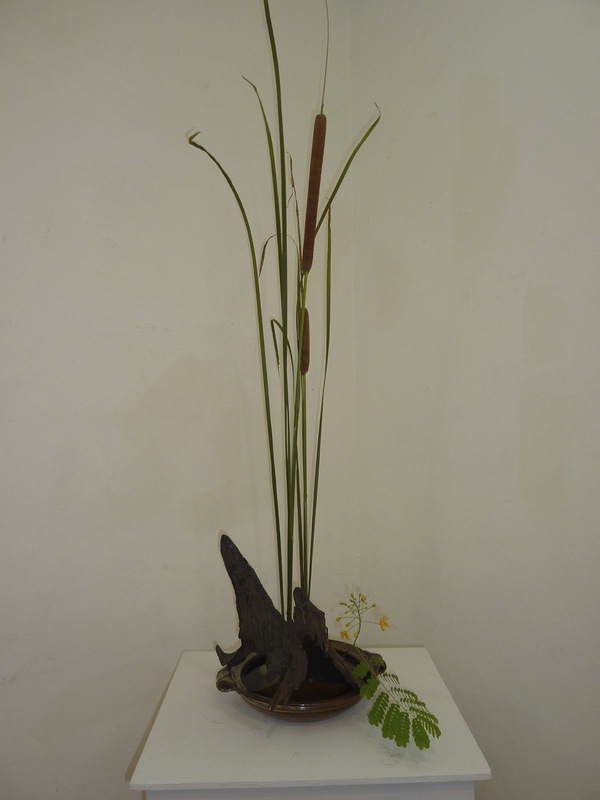 By Chitra - A large palm leaf, bulrushes, chrysanthemums and limoneum, in a ceramic vase. I title this Achievement, a child grows and stands tall like the bulrush. 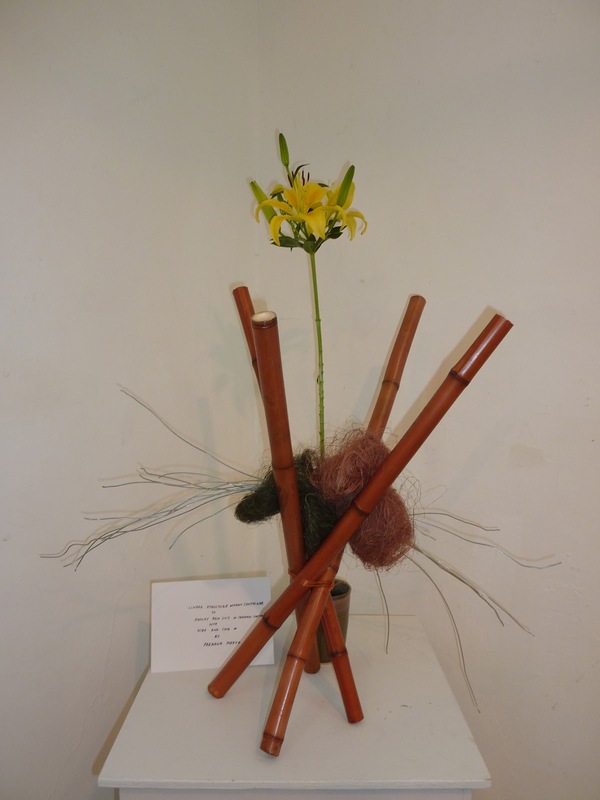 Seetha's granite vase composition recreated in absentia by Malathi and Chitra! life's ups and downs, grow tall and shine bright. 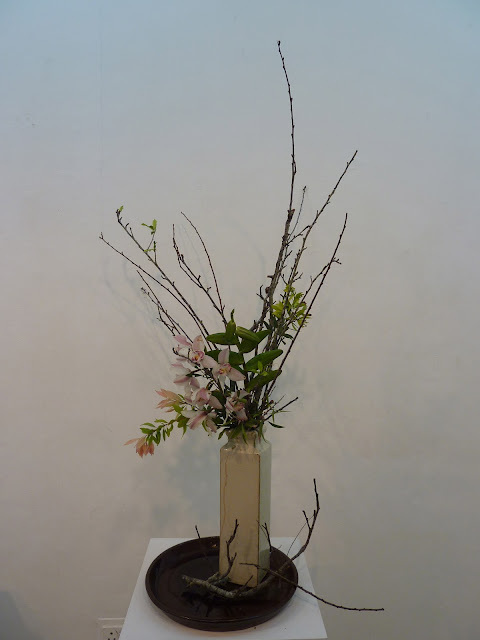 ABK AOTS Dosokai has organised a festival of Japanese craft and art, to celebrate Hana Matsuri, the girls festival. The senseis of the Sogetsu Study Group, Chennai have also participated, and we have worked with a theme of pink, to celebrate the girl child. 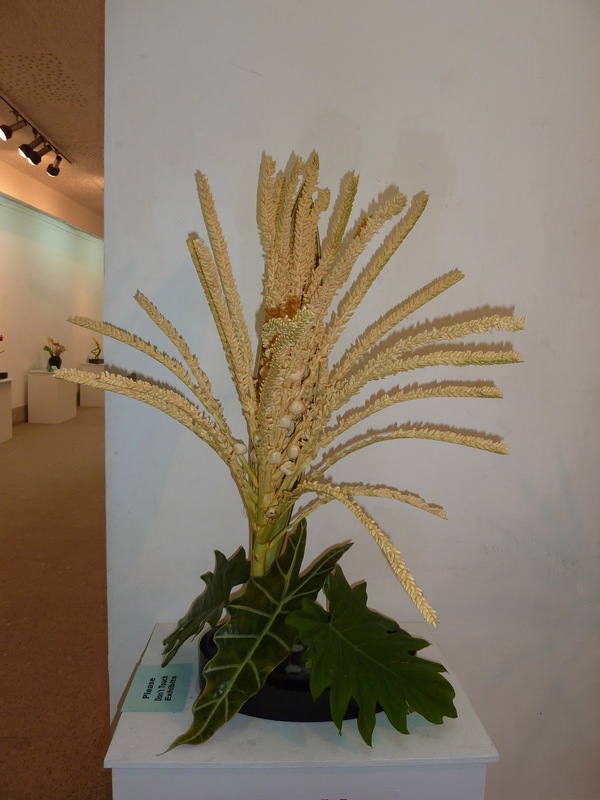 Do go and visit the exhibition, which also includes bonsai, dolls and clay flowers. By Prerana and Trishala - There are a pair of old, copper boilers, one each from our homes! We used the coal in the base to provide a framework. The heliconia was like the heat rising up and the white limoneum clouds like puffs of steam! The two boilers are unified in composition by the brown plastic swirls. It was an exciting challenge to create such a large, joint composition! By Prerana - Bird's nest. 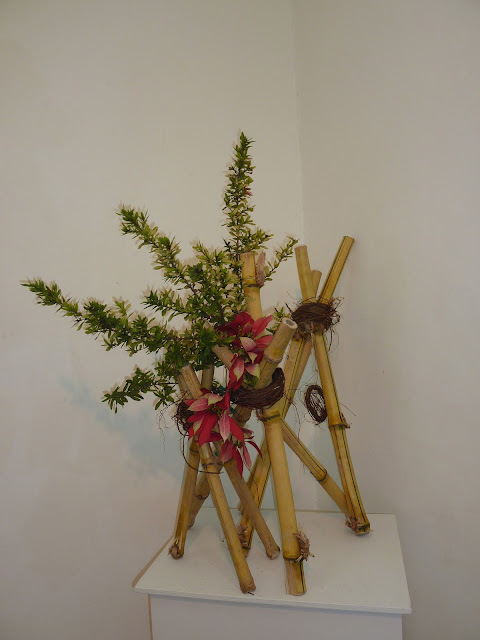 Bamboo sticks tied together to create a bird's nest. 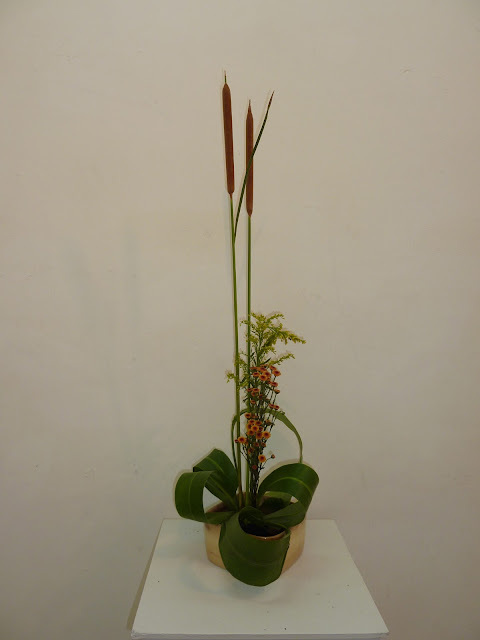 The yellow lily signifies the life-giving energy from the sun. 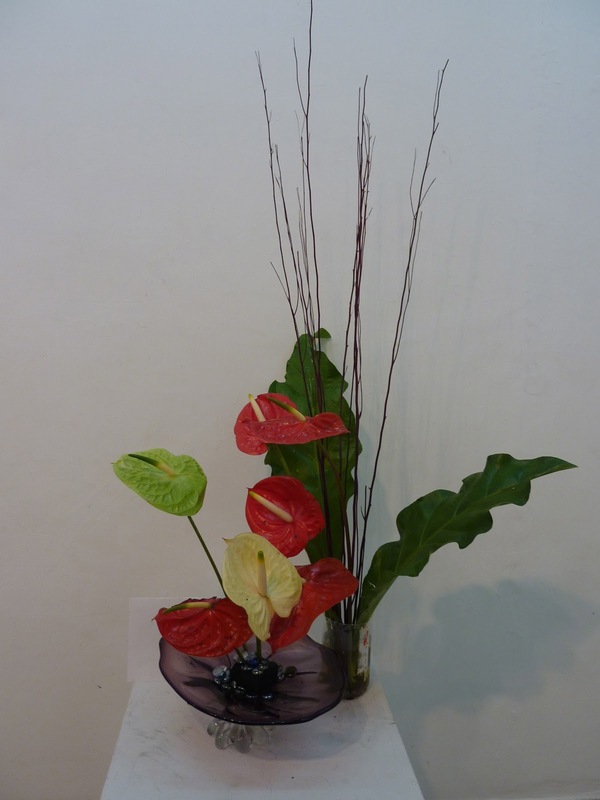 By Trishala - the beautiful caladium leaf is showcased. I emphasized line by displaying the alstromeria as a bundled set of stalks. The plastic balls added a hint of drsms, while also helping to cover the pinholder. 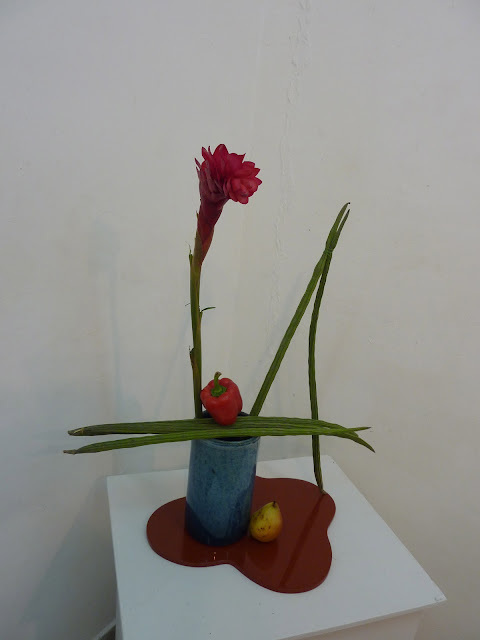 By Prerana - Still life. Morimono, thes use of fruit and vegetables. 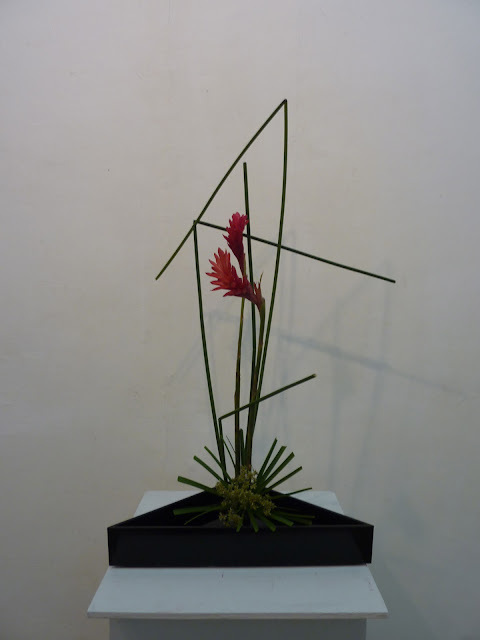 With minimal spending on flowers, we can still do Ikebana. By Trishala - A tall linear composition, the curled aspidistras complementing the vase. 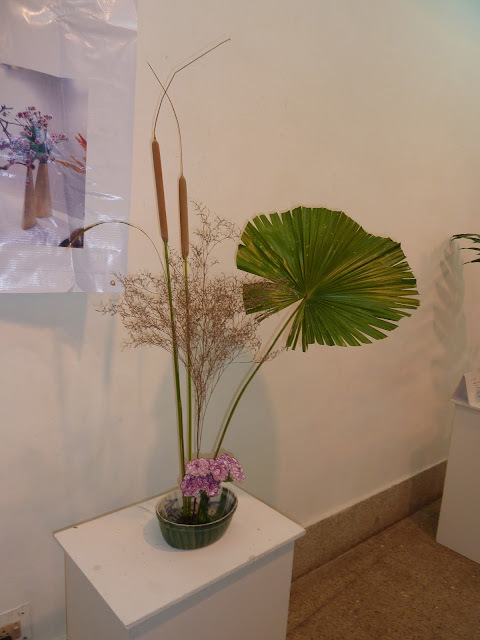 By Trishala - This interesting vase is from Auroville. The browns of the vase are complemented in the brown lines. The surface of the pothas leaf balanced the ornamental bananas. 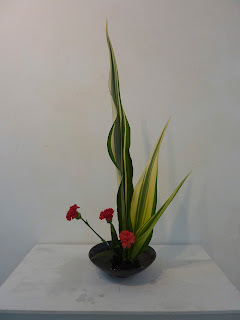 By Trishala - An all leaf arrangement in a glass container demonstrates the presence of so many shades of green in the market. 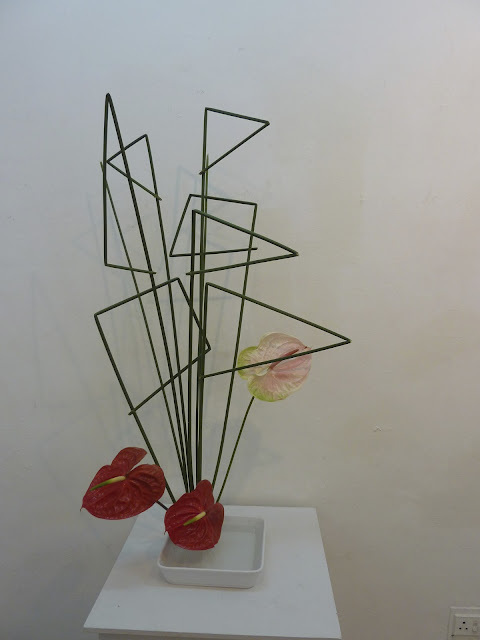 Sensei Molly experimented with the large green surfaces of the Monstera leaves and the glossy waxed anthurium surfacesin her arrangements, and worked in strong lines as well. 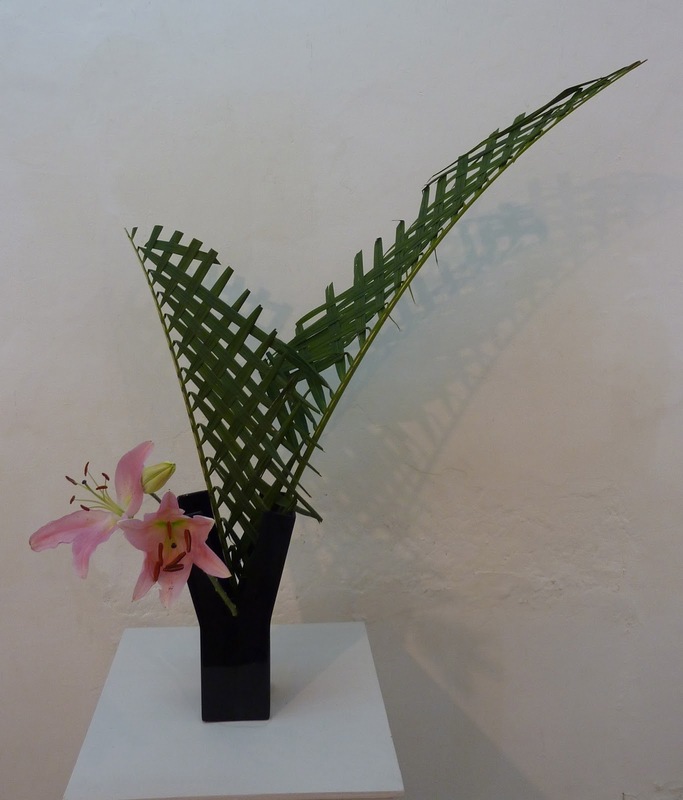 By Molly - My container is a white bamboo basket, and I complemented its roundness with these large monstera leaves showing surface and the Heliconia added line. 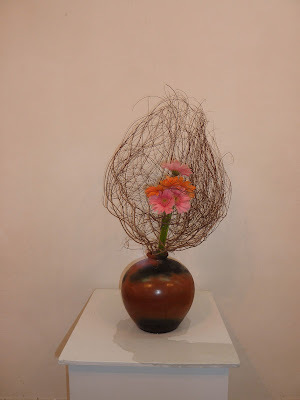 The bleached vine complemented the texture of the basket. By Molly - This creation has no vase as such. 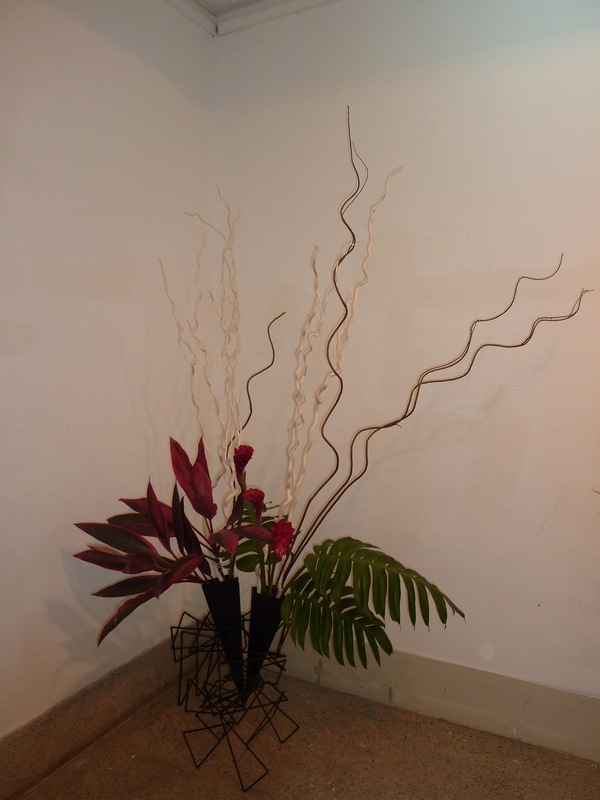 Bamboo stems in different lengths tied together with Banyan prop roots to show line. Poinsettia leaves massed together. Red colour of Poinsettia and variegated Ixora leaves add colour. All the three elements - line, mass and colour seen here. 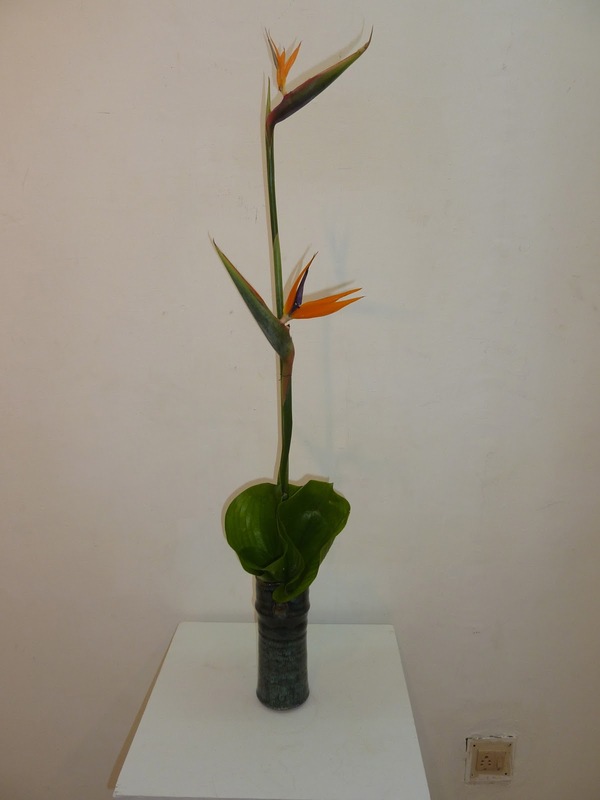 By Malathi - the vase has interesting colours and the brown of the line complements it. 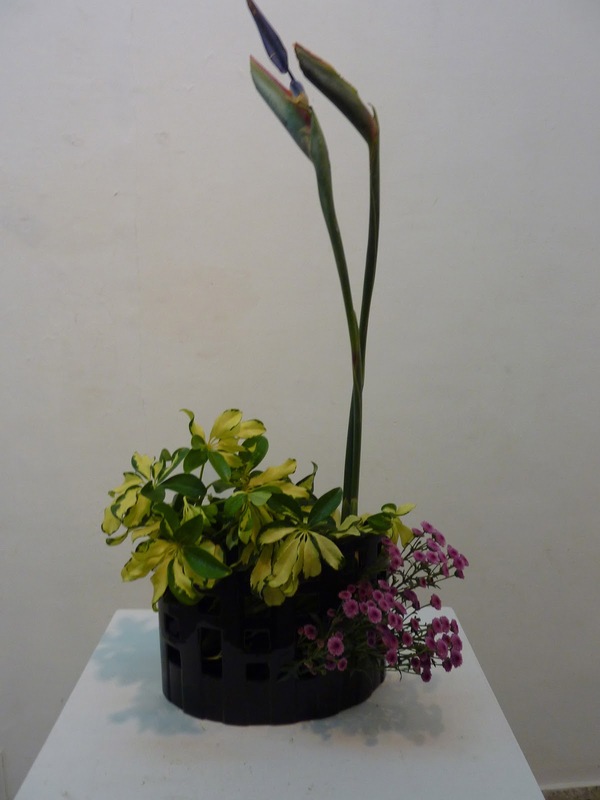 The wide sweep gives depth, and the agapanthus contrasts the colours of the vase. 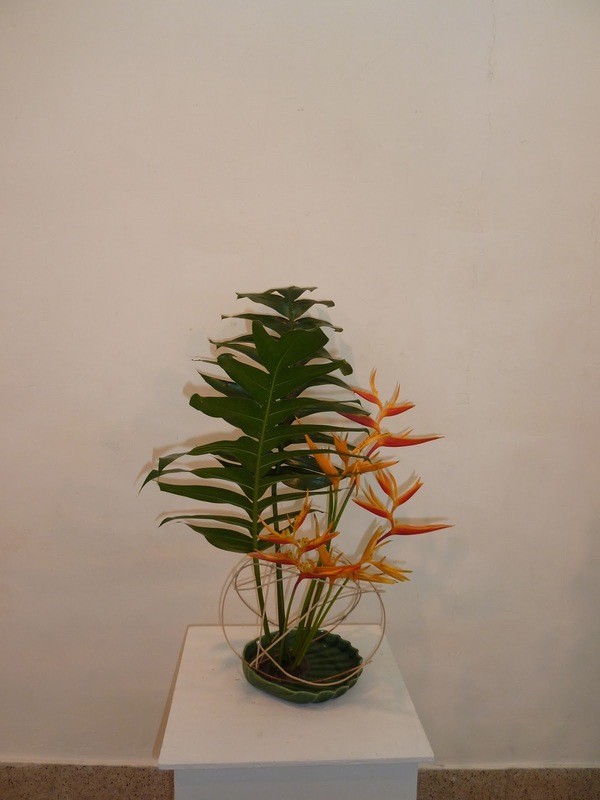 By Malathi - Click on the picture to see it large. 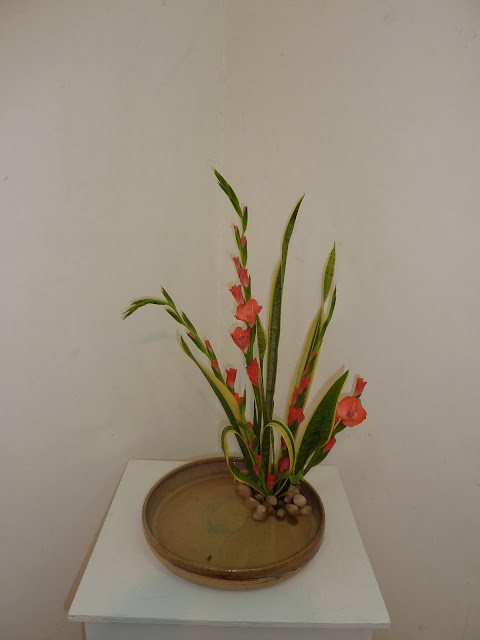 the Nagiere vase has a split, and the dracena has rich colours and a unusual curl which I wanted to highlight. By Chelvi. 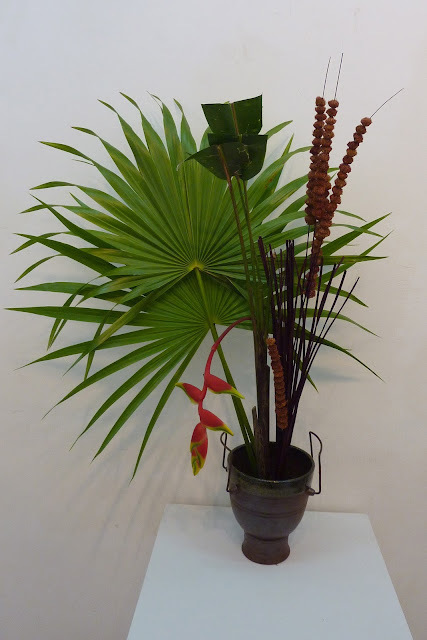 The Cycas leaves complement the texture of the combination vases and their shape provides drama. 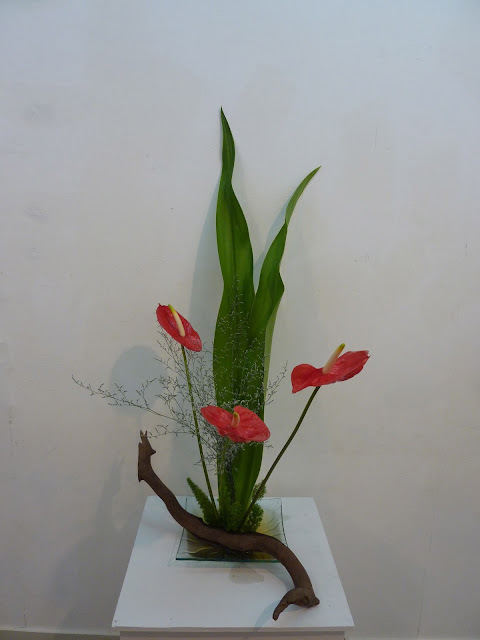 By Kalpana. Abstract composition with umbrella plant and ginger torch, the lines complementing the triangle Sogetsu vase. 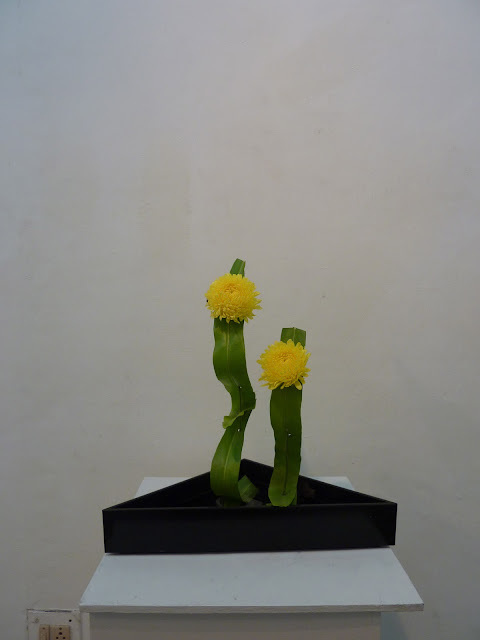 By Kalpana - a completely different and unusual composition in an identical trinagular vase, titled "Twins"
While Dalley is inspired by her beautiful garden, Ambika takes inspiration from her urban environment. 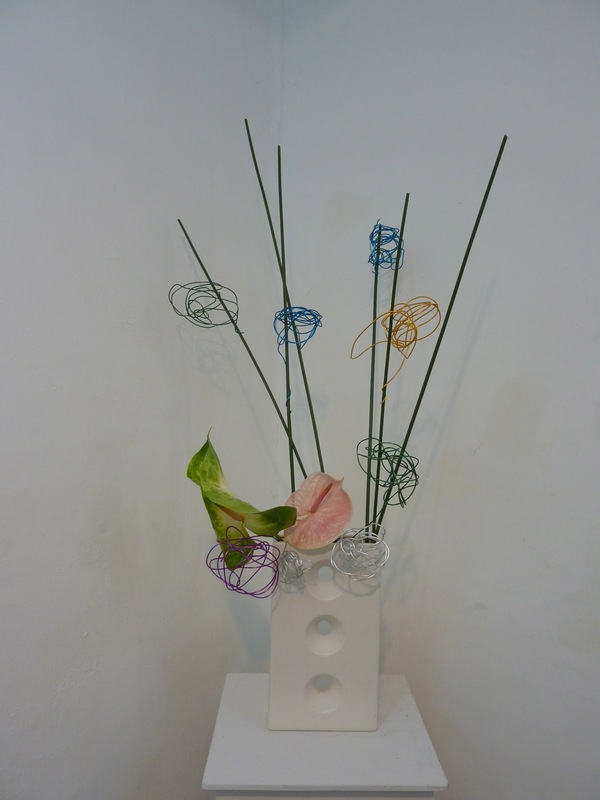 Two contrasting creative styles, unified by flowers! By Dalley - "Ah! Spring!". A combination of pine and chrysanthemums in a pair of galvanised steel containers, reminds me of spring. By Ambika - "Window dressing". The white of the thermocol is brought to life by colourful dried material, and the rich colours of jerberas and anthuriums. Reminded me of shop windows of a fashion store. By Dalley - "Manoharam". Nature gives us so much beauty in flowers, fruits and leaves. The Punnai leaves and the jackfruit remind me of Kerala. The container is a Vietnamese ginger jar. By Dalley - "Remembering Fukushima". 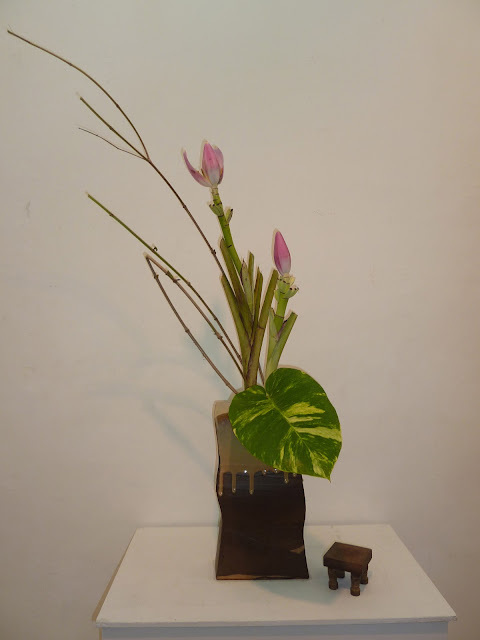 This Asian Nagiere vase inspired me to recreate a Japanese scene, fresh from my visit this summer. By Ambika - "Marriage" - A beautiful thing, that allows me to explore and grow and discover myself. 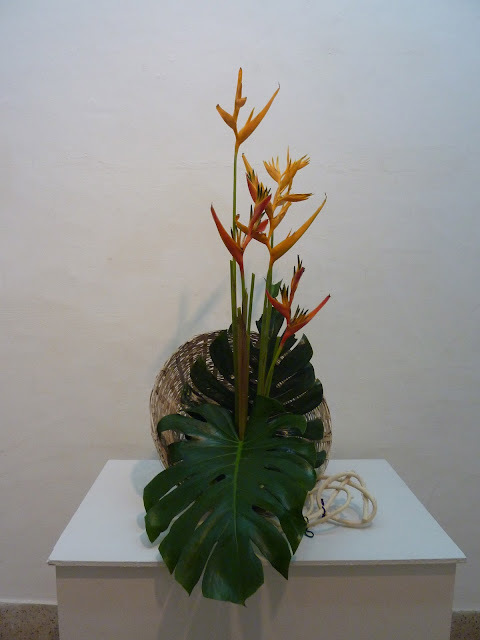 By Ambika - "Ode to the Western Ghats" - Inspired by my visit to the Western Ghats in Goa. Vaishali sensei seemed to prefer white vases this year, exploring abstract and naturalistic styles with both fresh and artificial material. Pushkala also worked witha variety of materials and styles, a lot of her materials being from her environment. 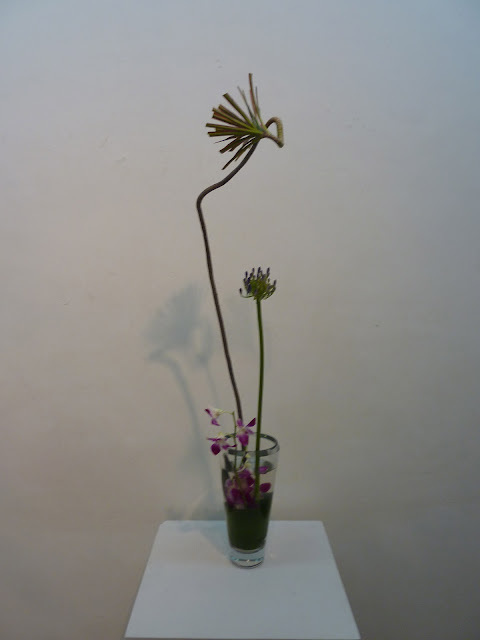 By Pushkala - I tried combining a horizontal dry line with vertical fresh lines, in a glass vase. 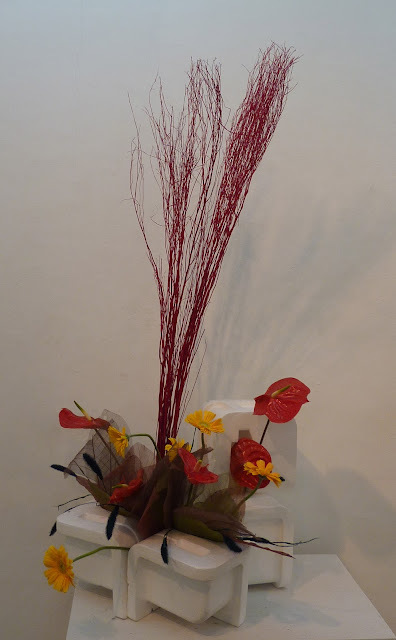 By Pushkala - "An expression of Nature’s creativity with human mind as a tool"
By Vaishali - The coloured wires added a cheerful note to my arrangement. By Vaishali - I found a chikoo branch lying, and I combined it with chrysanthemums in this fibreglass vase. By Pushkala - for a creative mind, noting is perceived as "waste"! 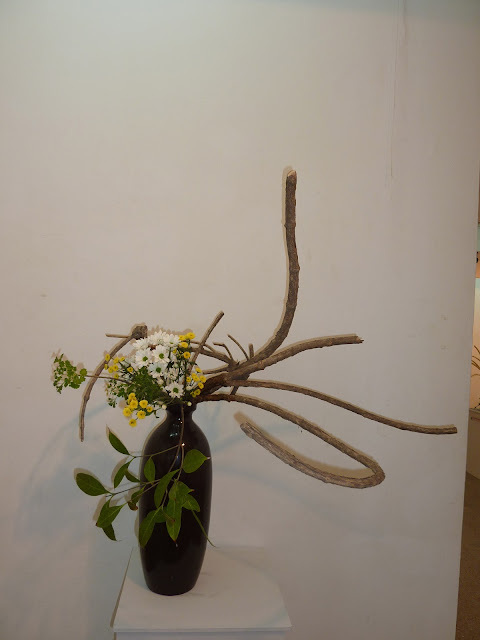 By Pushkala - My efforts at representing an ecosystem on a table. By Pushkala - a simple and elegant composition suitable for a tabletop. 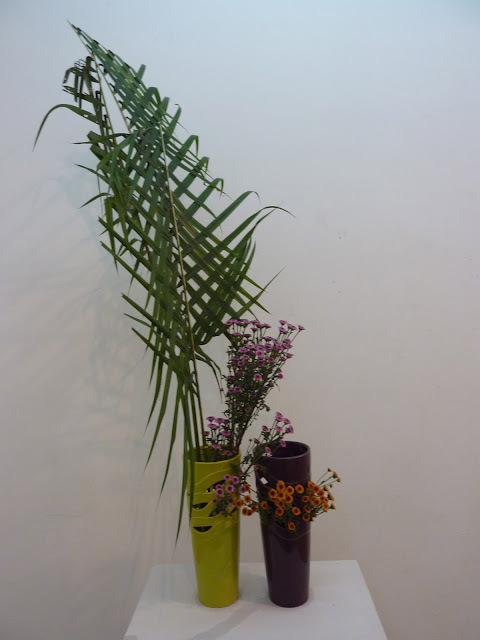 By Vaishali - I found these braided palms unused, and used it in my split black vase, contrasted with the lilies for colour.